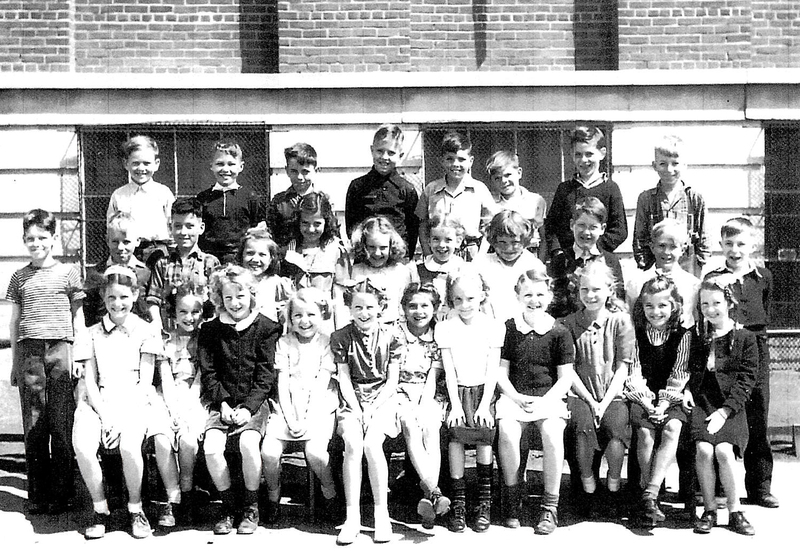 Photo: Connaught School 1944 Grade 3 Class. Back row (right to left): Barry Cooper, Kenneth Marco, Jack Roland, Jack Proud, Gordon McKee, David Hogg, Ronald Gilbert, Bob Kirby. Middle: Maurice Price, Russell Cunningham, Gerald Dixon, Ruth Wheeler, Sherill Smith, Sheryl Fanson, Elaine Bevan, Sharon Bruce, Donald Birney, Donald Urquhart, Bobby L(?). Front: Morage Graham, Marlene Bague, Sylvia Gessey, Doreen Hughes, Beverly Williams, Joan Gardner, Muriel Saunders, Arlene Hisekorn, Marilyn Moffet, Dorothy MacKenzie, Nancy Smail. David was surprised with another alumnus, George Beckett, contacted him by phone and told him about the project to gather memories of Connaught. The two former classmates and their wives arranged to meet in Richmond, BC, to talk about the old days. Afterwards, David wrote down his thoughts and mailed them to Regina for all to read. Donald McKenzie attended Connaught from 1941 to 1950. He remembers many aspects of school life, including some of the trouble students go into! Please click here to read Donald McKenzie’s Memories of Connaught. Please click here to see Joy Stewart’s collection of class photos from 1960 to 1968. Visit our Digital Archives for more class photos, old graduation programs and other documents.